eyeko's two newest polishes are at the opposite ends of the spectrum from each other. saucy polish for naughty nails and rain polish for city nails couldn't get much different from each other, but it's cool that they came out at the same time and together! something for everyone huh. saucy polish is a HOT red scarlet polish that is seriously an uber creme. i don't have too many straight red cremes, i don't usually feel like they suit me all that much, but i could get used to this one. it went on really well, my ring finger had basecoat issues haha. this is two coats but someone who is more careful than i could get away with one, this is SOOOO pigmented! 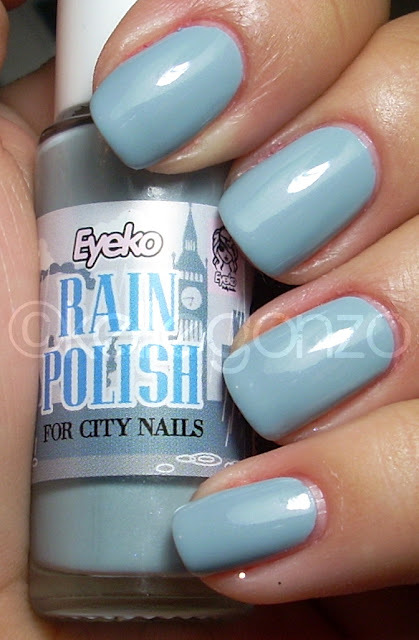 rain polish is a chic light grey blue color with the slightest hint of shimmer. really reminds me of london's cloudy skies so of course i love it! two coats here too :) i love opaque cremes! i just love eyeko's labels! they're adorable. *yawn* should really go to beddy-by. i'm going to see Kings of Leon in concert tomorrow!! i'm so excited i could pee my pants, they're my favorite band ever!! yay! disclosure: this product/products were sent to me for review purposes. i oppose the "safe cosmetics act"